This is a 1988 US spec Panther Kallista. 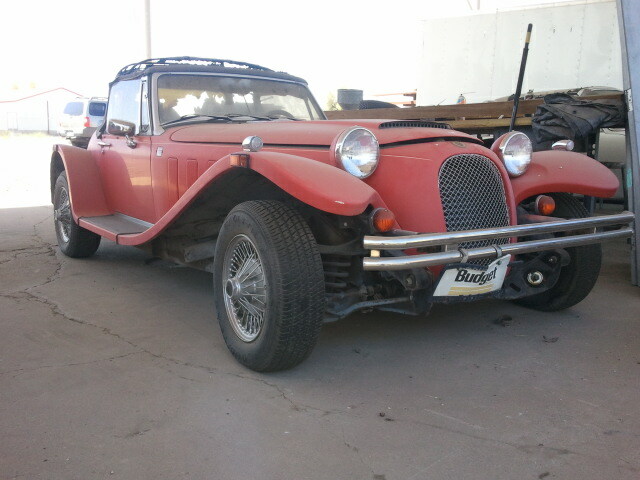 It is not a kit car. British car company, Panther Westwinds, was founded in 1972 by Robert Jankel. Early on they built high end replicars. In 1976 Panther introduced the "Lima". Its styling was based on no specific car, just an amalgamation of styling cues from 1930s through early 1950s British sports cars. The drivetrain and many other parts came from Vauxhall. Panther managed to sell 190 Limas in 1977, 250 in 1978 and 350 in 1979. The Panther Westwinds company collapsed in 1980. Its assets were purchased by Korean businessman Young Chull Kim. The company was renamed Panther Car Company. Jankel remained on as an employee. One of Kim's first directives to Jankel was to develop a car to replace the Lima. The Kallista is that car. 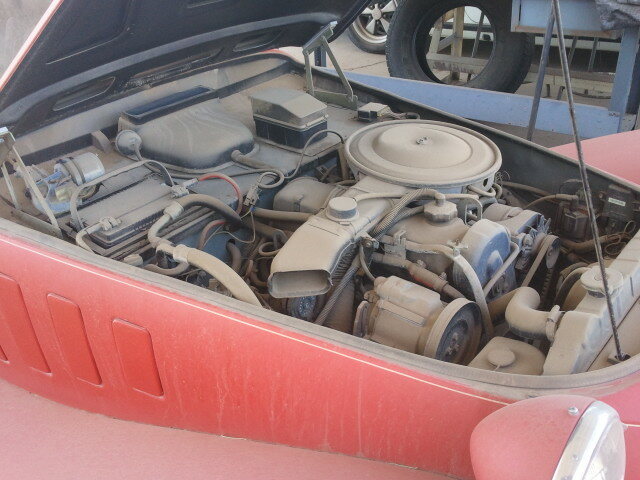 The Kallista uses Ford running gear. In Europe it could be had with a 1.6 liter 4 or a 2.9 liter V6. Panther sold 26 Kallistas in the US in 1985, 79 in 1986, 13 in 1987 and 30 in 1988. 1988 was the last year it was offered here. In the mid-1980s the Panther Car Company was purchased by SsangYong Motor Company. SsangYong built the Kallista in the UK until 1990 and for another 2 years in Korea. During its time, Panther built and designed some other notable cars. The 6 wheeled Panther 6 is truly bizarre (only 2 were built), but the Solo is a car I would have killed to own. OK, this is one of the 30 cars that were sold in the US in 1988. Sadly, it has an automatic transmission. It's in rough shape. The seller's complete description is "Panther, 2.3L with 5,092 miles. Car was perfect before vehicle left outside for yrs, so here it is. Hail damage." 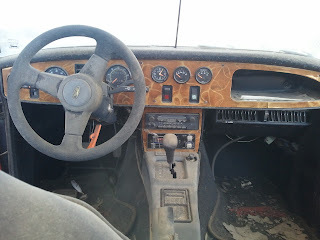 Besides the hail damage, the interior and top are shot. This is not a project for the faint of heart (or for those on a tight budget) but, given its rarity, it would be a great car to restore and show. 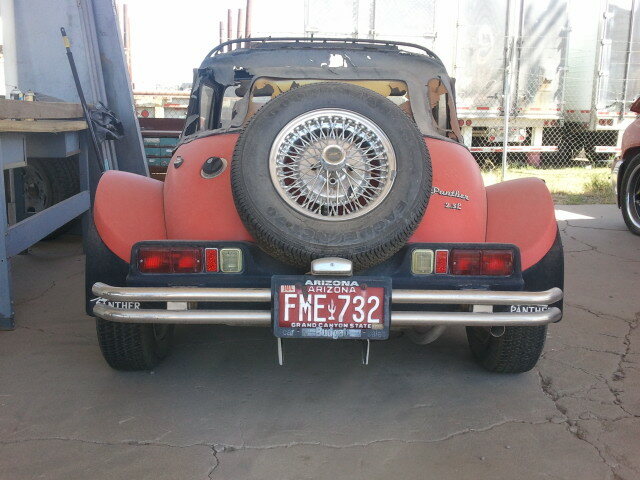 Located in Phoenix, AZ, click here to see the eBay listing.